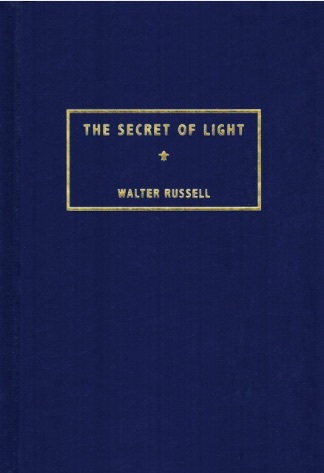 A century and more ahead of his time, Walter Russell, in The Secret of Light presents a unique Cosmogony, that of a universe in which Creator and Creation are proven to be a seamless, unified whole, and in which the dualism of "mind and matter" disappears. In revelation of what he terms "natural science," Russell presents a two-way, magnetic-electric thought-wave universe, cyclic in nature and eternally "creating," as opposed to the "created, expanding, entropic universe" of current science. Russell's philosophy of the science of Being, the invisible world of Cause” the nature of consciousness, knowing, thinking, sensing, inspiration, intuition, energy, and the creative process” and the science of Expressed Being, the visible world of Effect” the nature of light, the wave structure of universal creation, the creation of the elements that make up our visible world, and the cycle nature of life and death -” are proven a unified continuum. The Secret of Light illuminates the many questions regarding the nature of "science and consciousness." Dr. Francis Trevelyan Miller (LITT.D., LL.D. ), Historical Foundations, New York, wrote in 1947 of The Secret of Light, "I hasten to congratulate you on your epoch-making achievement in giving the world The Secret of Light. In this little volume, with its tremendous magnitude of thought, you have given Science and human knowledge a rebirth” a transmigration from its physical plane to its potential grandeur on the cosmic plane. "You have opened the door into the infinite” science must enter. It may hesitate; it may engage in controversy, but it cannot afford to ignore the principles you have established which eventually will revolutionize man's concept of himself, his world, his universe, and his human problems. "You have done for us in the Twentieth Century what Ptolemy, Euclid, Copernicus, Galileo, Kepler did for their earlier centuries. But you have further penetrated all physical barriers and extended your discoveries into definite forms of the infinite law which created our universe and keeps it in operation with mathematical precision through the millions of years. "Hitherto, Science while delving into these infinite sources has not attempted to define them. It has left the terminology to the ecclesiastics and theological dialectics. You have the courage and vision to start where they leave off” to explore the creative or spiritual law which motivates everything that exists: principles of far greater import than Einstein's relativity. I hail you as a forerunner of our New Age of Science."